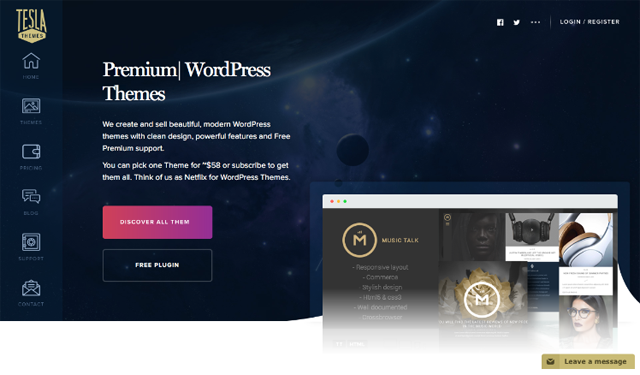 TeslaThemes launched in 2013 so considering their competition, they are relatively young in the premium WordPress themes game. 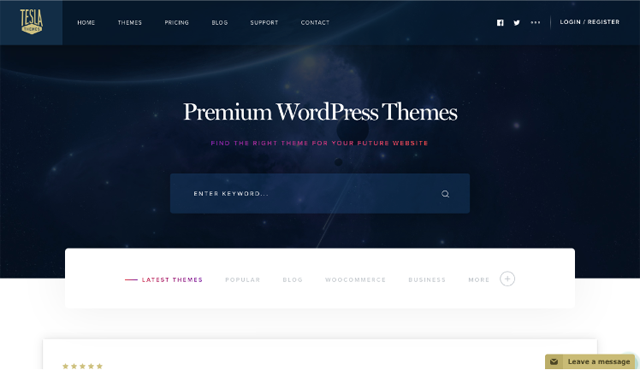 However, they know that what their customers need are new themes, so they set up to get out a 1.5 theme a month. So far they succeeded and they service over 26.000 customers. But, that can sound a little bit hasty and perhaps the turtle and the hare fable might cross your mind. So are they running a sprint in the world where you should run a marathon? If you ever used your email for the signup process, it will be a familiar process. After providing some basic info and your email, you will be sent a confirmation email. Click on the link in it and you will be taken to the information area where you will see that you just “purchased” their free membership. One more click and you are in the member’s area. Not the most streamlined signup process, but nothing complicated or new. 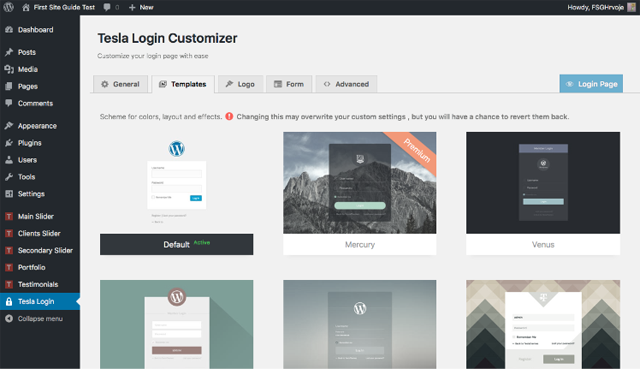 After that, you automatically have two free themes for download in your account. You can also purchase a theme or membership or test. 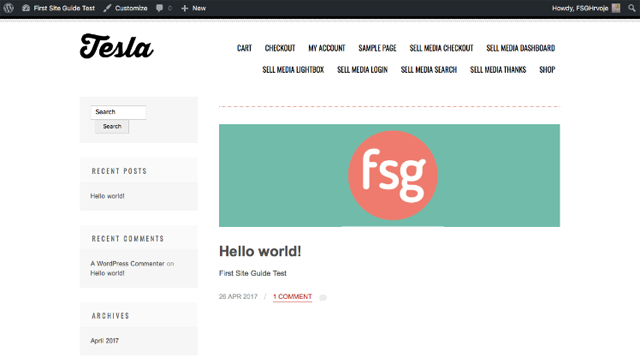 Then all you have to do is upload it in your WP dashboard in the .zip format and you are ready to go. On the first glance, even from their homepage TeslaThemes were gorgeous. With the darker tones and sleek animations, they were really selling us… well, what they are selling, pretty design themes. It was love at first click of a mouse. Since we noticed that they had Tesla Test room option, which is basically a Tesla Themes sandbox where you can try all of their themes for 7 days. It is an offer we didn’t find other provider provided. It was a nice test run, but do not be alarmed, it is a completely different, and temporary WP dashboard from your own. Just in case you were wondering where all of your stuff went. But we tried to see how does the engine works on its own, not in the ideal environment. So we tested out their Tesla theme, which is one of two free themes. Unfortunately, it did not install because it was missing the style.css stylesheet. Or so we thought. What we downloaded was a folder with compressed and decompressed files both in it, which is not your usual practice. So we automatically compressed it into the .zip file and of course, it did not work. It was an unexpected step that we were warned about but overlooked it. After installation, things were looking great and honestly, if you are interested just in some clean blogging experience, you do not have to touch a thing. There is an even free plugin for customizing your login, which is neat, but frankly, that is just some cosmetics, that your end users won’t see. However, gifted horse, mouth, you know how it goes. You can also import demo content, which is always a welcomed thing to have. While the Tesla themes do use a framework, there is no separate framework theme files to upload. They are set of files which are installed as a part of the themes themselves. However, this can be a problem if you plan to move, even between the themes. Sometimes having a framework and then themes are better in the long run. But coding is done well, so modifying themes will be easy and customization will depend on the level of your financial investment. There are currently 68 themes that all have their documentation written clear and concise. Not only their themes are coming with the slick designs that are drop dead gorgeous, they are responsive, which is really important in this day and age of mobile technology. They are also not lazy when it comes to a variety of themes. From magazines, gastro, medicine, e-commerce, you have it all. Novelty, iCook, MedPark, and Zeon are good examples of what we just listed. But while specializations are great, sometimes you want a general multi-purpose theme. Which Sevenfold is and we must recommend it. However, that is not the only one and listing them all would be an article of its own. Not to make things too long, we really do not have anything bad to say when it comes to design and graphics. Themes are just simply gorgeous. 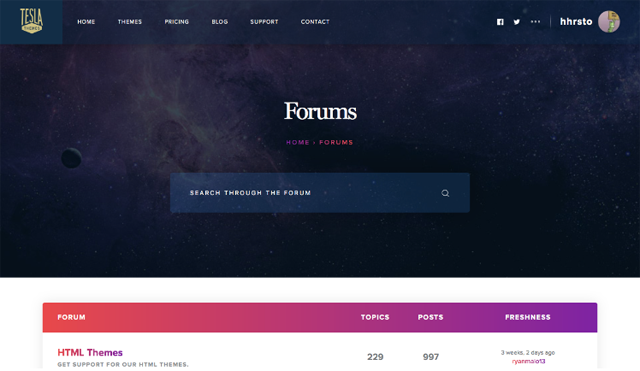 When it comes to support you will have email contact, FAQ, documentation for each theme and support forum. While Support forum is visible to every member, you will gain posting privileges only and if you become paying customers. Which basically means you can’t ask for help there. But their staff is polite and responsive, instructions clear and easy to work through and with the pricing that is relatively affordable, we think that you won’t have many problems along the way. 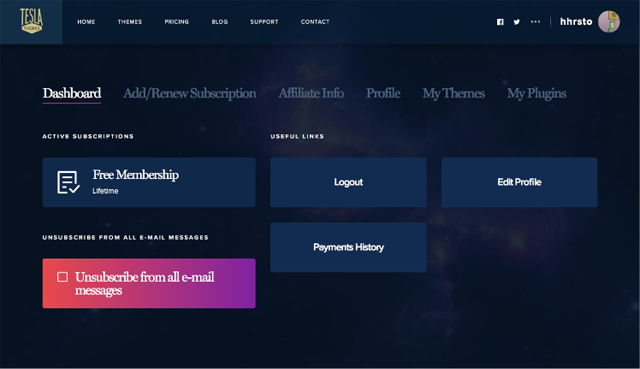 TeslaThemes comes in three pricing variants, excluding the free membership and it will allow you to use your design on unlimited websites. There is also Tesla Test Room where you can test WordPress Install with all themes in it for 7 days, after which the test website and created user will be deleted. There is also a 14 days money back guarantee. Developer will cost you $99. You will get access to all current and future themes, one year support, weekly updates and UI kit. Lifetime will cost you $189. You will get a lifetime access to all current and future themes, one year support, weekly updates, PSD files, and UI kit. You can also pay $79/y for the premium support or $39/mo for priority premium support. TeslaThemes should definitively be on your radar. They have some of the most drop dead gorgeous themes that are out today and they are publishing new ones with a speed that got us amazed. Even with their pricing, they fall somewhere in the more affordable middle, which is always great news for everyone’s wallet. When it comes to theme clubs, they might be a bit overlooked, but we would not be surprised if in a few years we saw them on top of each list. Sure, there might be some migration bugs, but that was about it. Their pricing goes up as the years go by and frankly, snatching their lifetime membership might be the decision that you won’t regret.